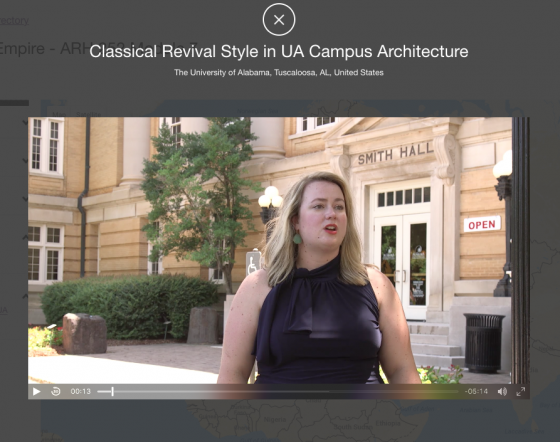 “If it’s not Baroque, don’t fix it!” It was my favorite joke when I taught survey art history courses on campus at the University of Alabama. But when I transitioned to developing online courses in 2013, that quip became the antithesis of my journey in creating an entirely new curriculum for the online learner. I found myself struggling with how to translate my classroom courses into online versions, which were initially intended only to serve as convenient alternatives to the “live” versions. Simply putting the curriculum into an online format ignored the intimacy—the “magic”—of the classroom experience. Most educators can tell you that anecdotes, brief asides, and humor are integral to the ideal didactic experience. The online courses simply could not match the level of student engagement I had seen in my lecture hall. I began to ask myself, “how do I capture the texture and context of the live educational environment and put it online?” An accountability of interest became the thesis of my quest. If I was bored with the curriculum, I knew that my students would be, too. The Answer to My Question was ARTmap: A companion website that operates seamlessly with embedded assignments, videos, and images that link back to the Blackboard platform and original course content. 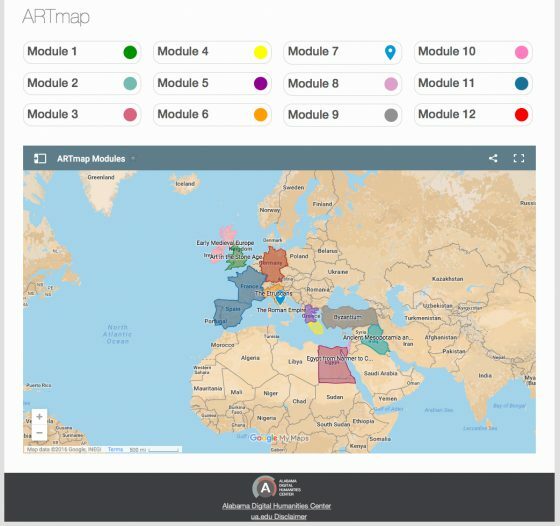 ARTmap was my first step towards marrying my educational content with the sophisticated digital interactivity that students experience online outside the university setting as a part of their everyday lives. With ARTmap, visual media and interactive online teaching are brought to a meeting point. 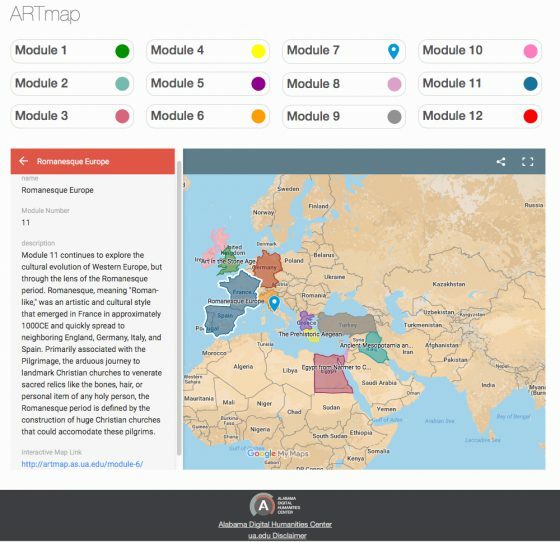 ARTmap enables a course experience unlike any we have attempted in our survey courses previously—lecture or online. The student navigates their course materials in a manner more akin to studying abroad than to studying in a lecture hall. Its map interface and interactive themes of travel and digital touring allows students to relate the material to their own past, present, and future experiences and how they relate those experiences to their community. Identifying Specific Course Challenges: how did we attempt to resolve the lack of student engagement and two-dimensionality of online art history courses? How do I replicate the engaging and entertaining idiosyncrasies of the classroom? 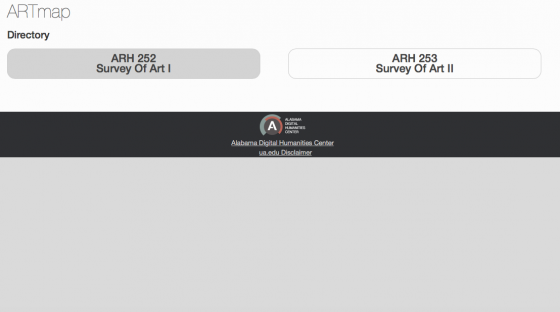 Building ARTmap: The tool was built in collaboration UA Department of Art and Art History with the College of Continuing Studies (CCS) and the Alabama Digital Humanities Center (ADHC). Personally, I feel that the collaboration itself was the real masterpiece, as it has laid significant groundwork for future endeavors. CCS and ADHC were the cornerstone of this project, and ARTmap would have never happened without them. 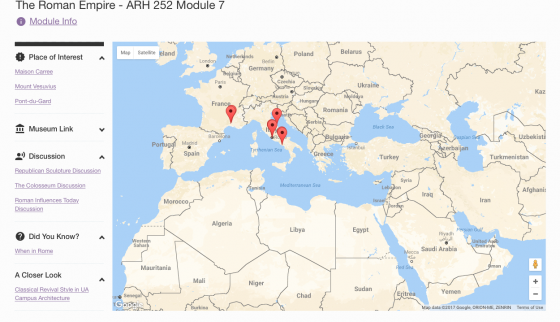 ARTmap Nuts and Bolts: The ARTmap landing site contains links to the two courses I teach: Survey of Art I and Survey of Art II. 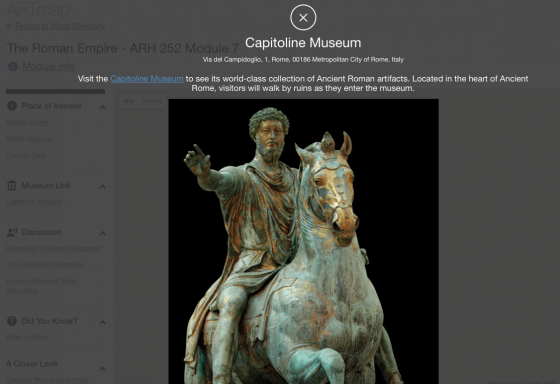 Once the student selects his or her specific course, ARTmap’s module pages correspond with the appropriate Blackboard module numbers and contain maps with pinged museums, art historical places of interests, and discussion prompts. 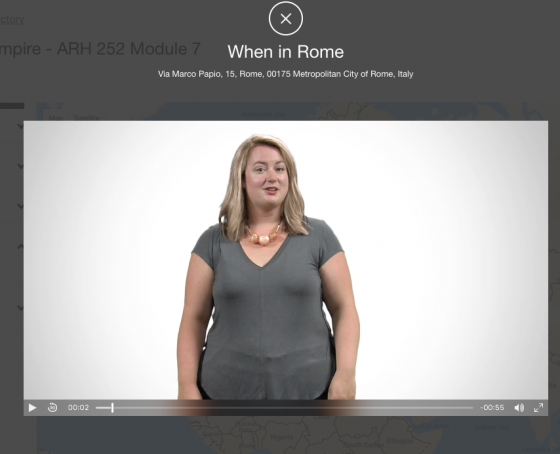 The modules also contain instructor videos illustrating a variety of personal anecdotes, travel experiences, and several long-form videos investigating peripheral material that would otherwise be removed from a traditional lecture to due time constraints often experienced in survey courses. Both of these types of videos (“did you knows” and “closer looks”) provide the necessary visual material in the absence of broader historical contexts enabled by in-person elaboration. 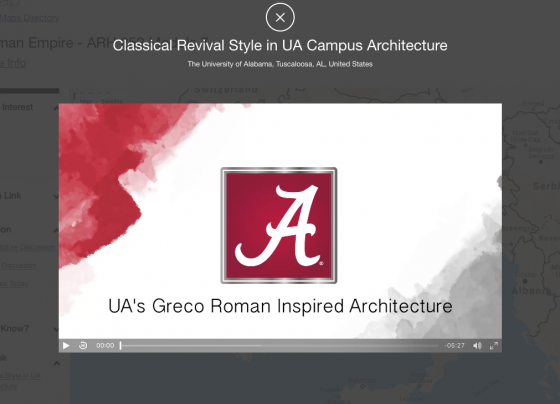 After visiting ARTmap Module 7 and watching A Closer Look at Classical Revival Style in UA Campus Architecture, you and your discussion group members are to create a “virtual museum” highlighting Classical Revival architectural elements inspired by the Greek and Roman architecture discussed in your textbook and module video lectures. Each student will select a structure/building, then research and discuss your assigned architectural element of that building. For example, if you are assigned to discuss a column and if you live in Tuscaloosa, it would be reasonable to select the Tuscaloosa Federal Building and Courthouse. Students will then research the necessary information about the courthouse and then present a detailed recorded discussion with visual aids. When your project is complete, your group will have created a presentation of many different structures with cohesive discussions of one specific architectural element. What is Next for ARTmap? There are two new phases that will be added to ARTmap. These phases will incorporate student travel logs that will showcase student’s personal photos from their travels and the location and content of their course projects. Beginning in Summer 2017, select student projects will be featured on the map with the pinged location of their projects and a link to their presentations. Additionally, all students will be invited to submit personal photographs of their travels with captions reflecting on their experiences. Both of these new phases will reinforces the notion that art history is a living, breathing discipline that connects us to our past, present, and future experiences. This is so exciting! Thanks for posting! This is amazing! It sounds specific to your courses at University of Alabama, but I was wondering if there were any plans to ever make this available to other instructors as a platform?